Via Trading has developed and fostered relationships with a wide network of carriers to bring you the most competitive shipping rates available. Shipping wholesale liquidation merchandise is often not as straightforward as shipping regular goods. At Via Trading we use a variety of materials to package and ship our merchandise, the most common being cases, bins, gaylords or shrink-wrapped pallets. Orders are typically shipped by Courier (Fedex), LTL (Less than Load) Carriers, Full Trailers or Containers. Own pick-up is also available. The cost of shipping by Courier or LTL is typically determined by the distance between origin & destination of the goods, the type of destination, the type of merchandise and the weight or quantity of the merchandise being shipped. The cost of shipping by Full Truckload or Ocean Container is typically determined by the distance between the origin and the destination of the goods. We typically ship out orders within 24 hours of payment though we do also offer same day shipping whenever possible. Domestic US shipments typically take 1 to 7 business days to reach their destination. Overseas air shipments can take 5-15 business days to reach their destination. Container shipments can take up anywhere from 15 to 60 days to reach their destination.The following sections will illustrate how shipping works in the wholesale industry, what options are available to you and what you can do to minimize your overall shipping costs. You may get Real-Time Shipping Quotes online or by calling or emailing us with what is you would like to order. Download a PDF version of our Shipping Information section and review it at your convenience! Certain items that are packed in small boxes are usually ship by courier such as Fedex instead of a trucking carrier. Shipping more than 1 box at a time is typically cheaper, as each additional box costs less to ship than the first one. Depending on how many case-packed items are ordered, it can sometimes be cheaper to put them all on one pallet and ship them with an LTL carrier. Your Account Manager and Logistics Department will always work with you to provide you the best possible shipping rate and method. Unless otherwise requested shipping quotes and shipments are conducted with the minimal default insurance. LTL stands for ’Less-Than-Load’ or a shipment of several pallets. LTLs can vary from 1 to 6 pallets. Orders over 6 Pallets may need to be consolidated into 6 pallets, shipped with 2 LTL Shipments or Shipped as a Full Load. We always provide you with the best shipping option for your review prior to finalizing your order. Generally, pallet deliveries to a residence will require a lift-gate to lower the pallets to the ground. For insurance and safety reasons, trucking carriers do not allow customers to climb onto the truck to manually unload their pallets. 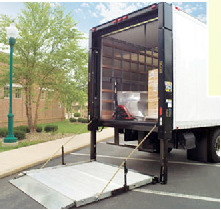 Commercial locations, if not equipped with a loading dock or forklift, will also require a lift-gate. LTL carriers charge extra for residential deliveries. Typically they will levy a flat fee of between $25-$75. Carriers also charge extra for trucks with lift-gates, typically a flat fee of around $25-$75. Deliveries are to curbside or to the loading dock. Drivers will not deliver your pallet(s) into your garage or inside your storage space, so be prepared to bring the items inside yourself or with the help of a friend. You will need to verify the pallets and shrink-wrap before signing the Bill of Lading upon delivery (or make annotations on it before signing it). If your pallet shows signs of having been opened, rummaged through, stolen from or otherwise tampered with during shipping, it is your responsibility to make a note of this on the Bill of Lading BEFORE you accept the merchandise. Should there have been any theft or loss during transit, failure to make annotations will significantly lower the chances of receiving any kind of compensation from the shipping company. Shipments are sent with minimal insurance ($0.50/lb to $1/lb). If you are shipping very expensive merchandise, please ask for additional insurance. Truckloads generally refer to a 48’ or 53’ truck filled with merchandise on pallets or hand-loaded. Truckloads usually cost a flat rate to ship based on the destination and mileage, irrespective of whether the truck is full or half empty. 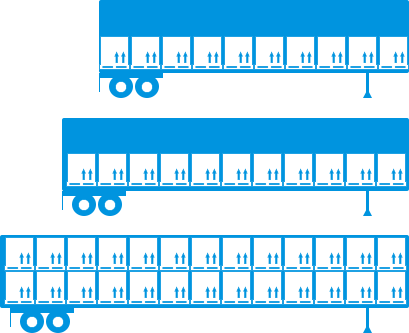 Larger orders that cannot be shipped economically as LTLs can often be cheaper to ship as a full load. Truckloads can be ordered with or without a lift-gate. Trucks with lift-gates can often be costly and it may be cheaper to rent a forklift for a day to assist you in unloading the truck. The latter is especially true when the merchandise is traveling long distances. Typically, 26 pallets can fit comfortably onto the floor of a 53’ truck bed with no double-stacking. However, many types of pallets can be double-stacked (assuming height is not greater than 4’) to allow between 26-52 pallets to be put on the truck, minimizing your overall landed cost per pallet. Some goods can be consolidated further or even hand-loaded (for example, a 70 pallet load may be able to be consolidated into 52 pallets; or 2 full loads may be able to be hand-loaded into a single truck). Make sure you have the means and ability to unload the truck. You will most likely need to provide the vendor with the day(s) and time that you can receive the load and whether you need to be notified in advance of the truck’s arrival. You typically have TWO (2) hours to unload the truck, and will be charged detention fees if the unloading takes longer. This is standard practice in the freight industry. Make sure you have the manpower available to help you unload in a timely manner. Be aware that there is a SEAL with a UNIQUE number on each truck. Make sure the seal number matches the number on the packing slip you will receive with the load. Most shipments can usually be moved OTR (over the road) on a regular truck, but occasionally, especially to distant locations, shipping by rail can be cheaper. Rail shipment procedures are the same as truckload procedures, but the shipping time is usually a bit longer. While truckloads can reach their destination within 1-6 business days, rail shipments can typically take around 10-15 days to arrive. 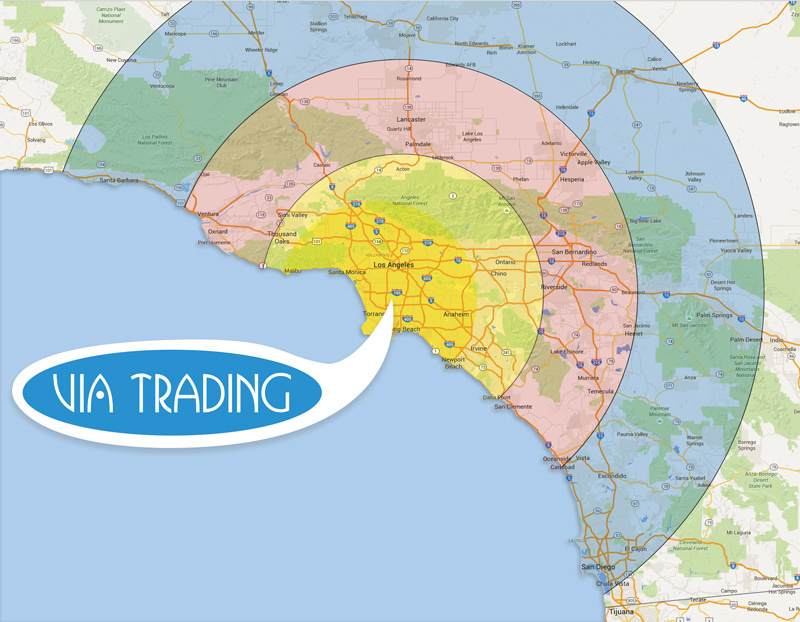 Via Trading offers subsidized Shipping Specials to customers within 150 miles of our facility in Lynwood. Ship up to 12 Pallets for a low price within most of Southern California! Prices include residential delivery with lift-gate. Cheaper than LTL deliveries! Cheaper than renting a u-haul & gas! Via Trading offers subsidized Shipping Specials to customers within 150 miles of our facility in Greater Los Angeles (Lynwood, 90262). Ship up to 12 Pallets for a low flat price within most of Southern California! Prices include residential delivery with lift-gate. Cheaper than LTL deliveries! Cheaper than renting a u-haul & gas! Our system cannot provide real-time quotes for Container or LCL (pallet shipments). Please email or call to get up to date shipping rates. Our system does quote International Orders of Case Packed goods which typically ship by Courier such as Fedex or USPS. Container Loads are typically the most cost-effective way to ship larger amounts of merchandise overseas. Ocean freight can cost between $2,500-$6,500 for a full container, depending on the size (20′, 40′, 45′) and the destination. It is the consignee’s responsibility to pay customs and taxes upon receipt or customs clearance of the merchandise. Many countries may have restrictions on what types of goods can be imported and some goods may be completely restricted from importation. Many countries also have brand protection and agency rights in place that prohibit the importation of certain brands into the country, other than from the authorized importer. It is the buyer’s responsibility to be informed of particular restrictions in the country to which products are being shipped. Via Trading cannot be held responsible for merchandise seized or refused at customs as a result of regulations or laws pertaining to that country. Please make sure you familiarize yourself with those costs & are able to successfully customs clear your goods given the information provided prior to placing orders. Please contact your local customs office prior to ordering to make sure the products purchased can be imported without restriction. U.S. Customs & Border Protection (CBP) has very broad authority to inspect Export Cargo & can select any shipment to examine. The cost of such inspections, if and when so ordered by CPB are the responsibility of the consignee. Customs clearance, duties and other related import fees and taxes are the responsibility of the consignee. When appropriate please make sure to check the Seal # matches the paperwork and is not tampered with. Please note: We export dozens of orders on a weekly basis. In the very large majority of cases (over 98%), orders are shipped and clear customs with no problems. Any shipping quotes or product quotes provided are only for shipping costs and for the merchandise sold – they DO NOT include any additional customs charges & tariffs or sales taxes which you may or may not incur. Due to the nature of our business, in most cases we are unable to provide detailed manifests and country of origins of the items we offer. In the majority of cases that does not cause any problems at customs, however we need to inform our customers that in very rare occasions clearing customs with such goods can be problematic & that Via Trading does not and cannot control that aspect of the sale. All shipping quotes are provided with minimal insurance. If you would like to purchase additional insurance, please let your account manager know before the order is finalized. 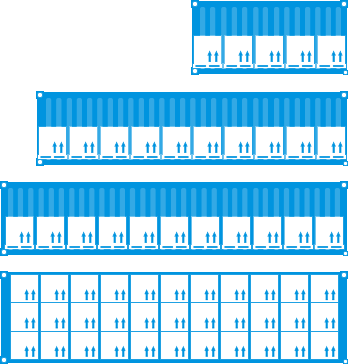 Less than Container Load shipments are smaller than a full ocean freight containers. LCL shipments are shipped by sea and typically take 45-60 days to reach their destination. It is typically cheaper to ship individual pallets by LCL than it is by air freight. LCL shipments can be very efficient and cost-effective when shipping expensive and high value pallets overseas. Due to the relatively high cost of shipping single pallets by LCL, LCL shipments are not suitable for low value pallets & very often shipping a full dedicated container can be much more economical then shipping 6 single pallets OCL. Ocean Container shipments are primarily used to ship large loads of merchandise outside of the United States and neighboring countries. OCL shipment costs are typically flat and based on the origin and destination of the goods. Ocean shipments can take 14-60 days to reach their destination. Containers are usually available in 3 lengths: 20’,40’ & 45’. Hand-loading goods for container shipments is a good way to maximize the space used in the container, and lower your relative shipping costs. 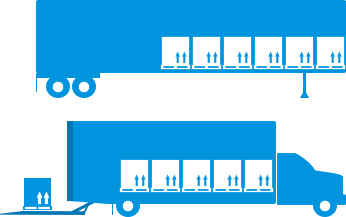 Hand-loading the merchandise can sometimes increase the capacity of the container by 2 or 3, as opposed to loading the merchandise on pallets. Not all goods can be hand-loaded, but be aware of the benefits of this option and request it when possible. Be aware of any unusual restrictions when importing goods, for example: wooden pallets are not allowed to be imported into Australia, some countries require fumigation certificates prior to shipment etc. Be sure to communicate these restrictions to your Account Manager. Importing unmanifested or even manifested customer return or liquidation loads into Canada can be problematic. Few brokers have experience working with such loads and limited product information. Via Trading can now refer and recommend you a Canada-based import, transportation & customs clearance specialist who can assist you with your purchases from the USA. ACA takes care of the whole process for you including logistics, document preparation, customs clearance and more. Contact your Account Manager to find appropriate merchandise. Once you know what you’d like to buy, we will put you in touch with ACA. This service is available for truckload purchases only. Please note we are still able to offer regular shipping of case-packed items to Canada with Fedex. *All payments for logistics, customs clearance and paperwork preparation are to be paid directly to ACA, and should be discussed with ACA in advance of completing the order process with Via Trading. ACA offers this service as a courtesy. Risks can still exist when importing goods into Canada. Neither Via Trading nor ACA can offer any guarantees as to the successful importation of any order. All shipments are subject to customs inspection and all costs associated with the importation of your order will be the purchaser’s responsibility. Due to the nature of Liquidation Goods & their relative low cost – at times shipping can become prohibitive. There are various methods you can use to reduce the relative cost of shipping. Please review this useful article to learn more about ways to Minimize relative Shipping Costs. SHIPPING MULTIPLE PALLETS IS OFTEN CHEAPER THAN SHIPPING JUST ONE. Much of the initial cost of shipping covers the pick-up, the delivery and the administrative paperwork. These are generally fixed costs and shipping one pallet will always be relatively more expensive than shipping multiple pallets. After that initial charge, the cost for the second or third pallet only goes up marginally. This is especially true when shipping to residential addresses and/or when shipping with a lift-gate since both are relatively fixed flat charges. 3 Pallets for $750/pallet + $275 Shipping for a total landed cost per pallet of $841.67 ($53.33 cheaper per pallet or 5.96% Cheaper). Often times, the residential surcharge is very reasonable once you factor in the time and out-of-pocket expenses you would incur by picking up the pallet from the terminal yourself. If you only have space for 1 or 2 pallets but the shipping costs are rather elevated, you can opt to add a couple of case-packed items to your order. Case-packed items are items which when ordered alone, are typically shipped by Courier such as Fedex. 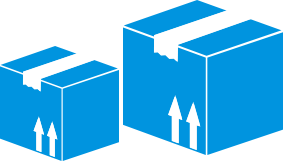 Case packs are sold in smaller lots, packed inside small boxes that are relatively low weight and can be consolidated with most pallet orders and shipped at little to no additional charge. 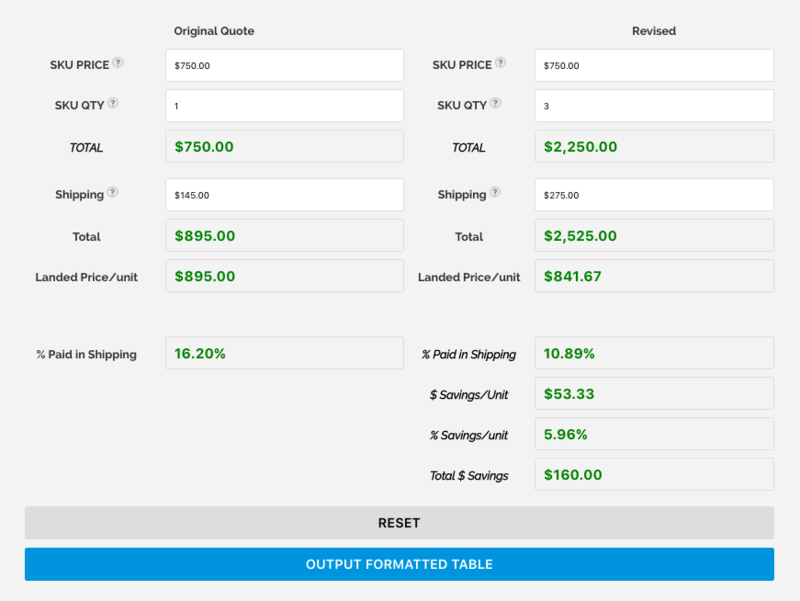 In the Example below Customer initially is purchasing 1 pallet of Water Dispensers initially for a total of $540 on Merchandise + $220.90 shipping (almost 30% of total $ investment goes in shipping). When adding 1 or more case packs (2 in this case) Customers Shipping Cost only increases by $9.91 so now customer spends $975 on Merchandise + $230.90 on Shipping – result being that total $ spend on shipping is reduced to only 20% of total investment). When purchasing larger loads of merchandise such as full truckloads, it is also a good idea to use up ALL of the space on the truck. In the large majority of cases, shipping rates for full truckloads or containers are FLAT and do not change whether the truck is filled to capacity or half empty. Depending on the type of pallets & trailer/container used 24 to 52 pallets can typically fit on a truck. Above examples are also extremely valid if you are eligible for our SoCal shipping specials. Read more about out our Flat Rate SoCal Shipping Specials. To obtain a real-time online shipping quote please register or log in to your account. Feel free to call or email us any time should you prefer to obtain a quote by email or phone. Our system will provide you a quote based on the information entered in your “Ship to” address book. Please note you may add an unlimited number of shipping addresses in your account and you can quickly calculate the cost of shipping to your different destinations. If the information is entered inaccurately (wrong address or type of destination), the returned quote may not be accurate and we may contact you to adjust your address and/or revise the shipping quote. Please make sure that you accurately note whether your ship-to address is commercial* or residential** and whether you need a lift-gate or not. Feel free to chat live with a support agent or contact us by email or phone, or email us to request a customized quote. Generally, pallet deliveries to a residence will require a lift-gate to lower the pallet(s) to the ground. Commercial locations, if not equipped with a loading dock or a forklift will also require a lift-gate. LTL carriers charge extra for residential deliveries. They will usually levy a flat fee of between $25-$75. Carriers also charge extra for trucks with lift-gates, typically a flat fee of around $25-$75. *Commercial Delivery: business location, storage unit, warehouse, store. ** Residential Delivery: house, apartment complex, residence of any kind. Generally speaking, the cost to ship one pallet ranges from $90 – $200 and varies according to the weight and contents of the pallet. Shipping subsequent pallets is considerably cheaper, especially if shipping to a residence (for example it might cost $200 to ship 1 pallet, but only $275 to ship 2 pallets, and $310 to ship 3 pallets). Visit our resource pages for more information on shipping pallets. Truckload shipping is calculated based on mileage and usually ranges between $1.00/mile to $2.00/mile with a minimum charge of $350. Visit our truckload shipping page for more information. Case-packed items shipped out with USPS generally cost approximately $25-$50 per box depending on the weight of the items being shipped. Please Note: all shipping quotes sent out by email or over the phone are only quotes, and are to be confirmed once order is placed. All shipping quotes are provided with minimal insurance. If you would like to purchase additional insurance, please let your account manager know before the order is finalized.